The students had a great learning experience. Our thanks to all the people involved, many who kindly volunteered their March break to support the camps, as well as the Friends of Community Schools and Full Service Schools for their financial support. This March break program was a great success! TDSB Language Camp students recorded at Georges Vanier SS During the March Break, several students from across the TDSB took part in a Continuing Education language camp at Georges Vanier Secondary School (GVSS). Among a number of outstanding activities (some led by GVSS students hired by the TDSB as language assistants) some elementary students rehearsed the chorus of the song “We are the World” by Michael Jackson, in various languages (Cantonese, English, Korean, Mandarin, and Spanish), under the choir direction of Betty May. 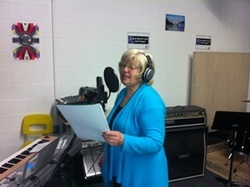 On Friday morning, 15 elementary school students were recorded singing the English chorus of that song at the Georges Vanier SS One World Youth Arts Project’s (OWYAP) Recording Studio, under the artistic direction of Ashley Ingram and the AISM Language Institute, who produced the final song in time for the afternoon show! The kids had a great time during the recording and this was a wonderful example of collaboration between Georges Vanier SS, Continuing Education, OWYAP, and AISM. Thank you to all the people involved, many of whom gave up their break to support and make this a success!